In this four year project COBECORE will develop a multi-faceted database, by making the static analog archives of the Institut National pour l’Etude Agronomique du Congo belge (INEAC) digitally accessible in addition to extracting eco-physiological relevant plant traits from historical herbarium specimens. 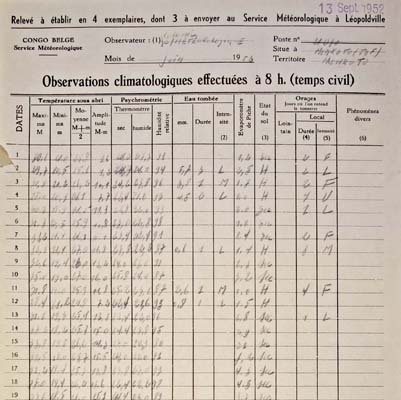 As such, the project will complement previously transcribed insular climate records (e.g. at Yangambi and Luki) with data gathered throughout the basin and provide additional ecologically relevant (inventory) data. In order to speed up data processing, and provide public outreach, we will crowd-source transcription of the eco-climatological data and some of the recovered plant traits.